I came across a quaint and adorable paper from SIGGRAPH’86: Two bit/pixel Full Color Encoding. It describes Color Cell Compression, an early ancestor of Adaptive Scalable Texture Compression which is all the rage these days. 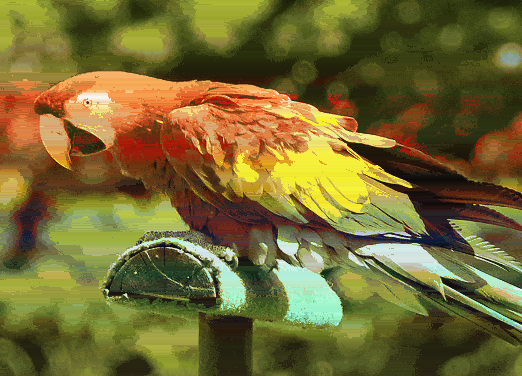 Like ASTC, it offers a fixed 2 bits/pixel encoding for color images. However, the first of many d’awwws in this paper comes as early as the second line of the abstract, when it suggests that a fixed rate is useful not for the random access we covet for rendering today, but simply for doing local image updates! The algorithm can compress a 640×480 image in just 11 seconds on a 3MHz VAX 11/750, and decompress it basically in real time. This means that it may allow full color video, unlike these impractical, newfangled transform based algorithms people are researching. The left half of the image is 24bpp, while the right is is 2bpp. Really the only way to tell is in the eyes, and I’m sure there’s an interesting, evolutionary explanation for that. The image is divided into 4×4 cells, and each cell is composed of only two different colors. In other words, the image is composed of 4×4 bitmaps with a two color palette, each chosen from an image-wide 8bit palette. A 4×4 bitmap would take up 16 bits, and two 8bit palette indices would take up 16 bits, for a total of 32 bits per 16 pixels — or 2 bits per pixel. The pixels in each cell are divided into two groups based on luminosity, and each group gets its own color based on the average color in the group. One of the reasons this works really well, the author says, is because video is always filmed so that a change in chromaticity has an associated change in luminosity — otherwise on-screen features would be invisible to the folks at home who still have black&white TVs! We now know enough to implement this lovely algorithm: find an 8bit palette covering the image, then for each cell of 4×4 pixels, divide the pixels into two groups based on whether their luminosity is over or under the cell average. Find the average color of each part, and find its closest match in the palette. However, let’s experiment! Why limit ourselves to 4×4 cells with 2 colors each from a palette of 256? What would happen if we used 8×8 cells with 3 colors each from a palette of 512? That also comes out to around 2 bpp. 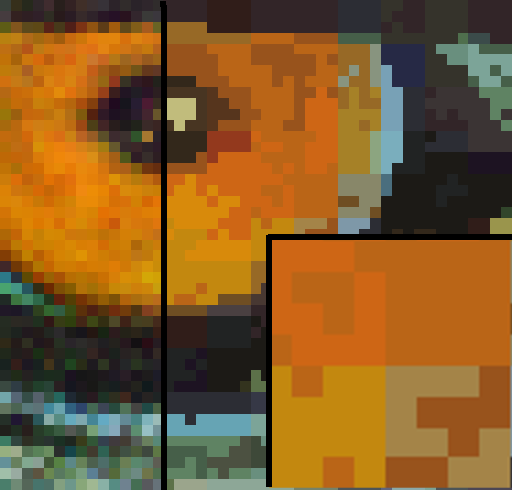 Parameterizing palette and cell size is easy, but how do we group pixels into k colors based on luminosity? Simple: instead of using the mean, we use k-means! Here’s a colorful parrot in original truecolor on the left, CCC with 4×4 cells in the middle, and 32×32 cells (1.01 bpp) on the right. Popartsy! The best part about this paper is the discussion of applications. For 24fps video interlaced at 320×480, they say, you would need a transfer rate of 470 kb/s. Current microcomputers have a transfer rate of 625 kb/s, so this is well within the realm of possibility. Today’s standard 30 megabyte hard drives could therefore store around 60 seconds of animation! Apart from the obvious benefits of digital video like no copy degradation and multiple resolutions, you can save space when panning a scene by simply transmitting the edge in the direction of the pan! You can even use CCC for electronic shopping. Since the images are so small and decoding so simple, you can make cheap terminals in great quantities, transmit images from a central location and provide accompanying audio commentary via cable! In addition to one-to-many applications, you can have one-to-one electronic, image based communication. In just one minute on a 9600bps phone connection, a graphic arts shop can transmit a 640×480 image to clients for approval and comment. You can even do many-to-many teleconferencing! Imagine the ability to show the speaker’s face, or a drawing they wish to present to the group on simple consumer hardware! Truly, the future is amazing. Here’s the JuicyPixel based Haskell implementation I used. It doesn’t actually encode the image, it just simulates the degradation. Ironically, this version is slower than the authors’ original, even though the hardware is five or six orders of magnitude faster! Apart from the parameterization, I added two other improvements: Firstly, instead of the naive RGB based average suggestion in the paper, it uses the YCrCb average. Second, instead of choosing the palette from the original image, it chooses it from the averages. This doesn’t matter much for colorful photograph, but gives better results for images lacking gradients.